At Vandzene, the factory was in a bad condition; dirty and a lot of the equipment was out of order. The manager said that nothing could be done as it was impossible to get any parts or repairs. With my previous experience at Snepele I knew that if I went in person with some butter I could get it, rather than leaving it to the committee. This way I could get anything that was in any of the warehouses so I took a truck and filled it with everything needed. 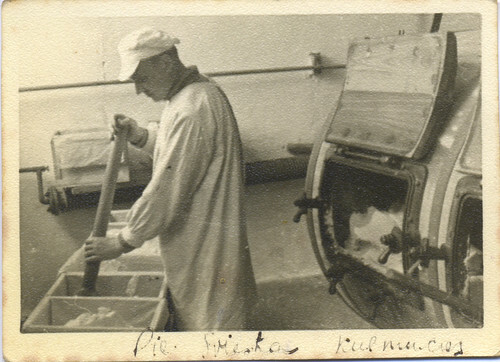 I had the whole place whitewashed and all the machinery fixed so that we could really start producing. The factory also owned a truck which had been abandoned in a shed because petrol was not available. To change it to gas I arranged for the fire brigade to take the truck to Riga and do the conversion. Now we had a truck to use and my plan was that if the Russians were to come closer we could escape in the truck. However, the unexpected happened – the Russians had already entered Tukums and somebody came who lived this side of Tukums and told us of how he had two cans of petrol buried in his garden and that we should go and dig them out. I was against using the truck but one of the members of the committee was going along too so I agreed. They went as far as Pure and asked at the town hall whether they knew how far the Russians were and were reassured that they were not near yet. Soon after they saw dust coming ahead – it was a Russian tank, a small tank. They were stopped and in the tank was an officer. The driver of the truck, who was small, jumped in the ditch and escaped but the committee member was arrested and the truck blown up. The committee member was a civil guard and was well-dressed and had shiny boots. The driver came back after about three days and told us about it. The wife of the committee member was coming to me crying about what I had done had killed her husband. Later, he also came home and told how the commanding officer he was taken to admitted that his responsibility did not include taking prisoners. When asked about his boots he told how the Russian soldiers had taken them and he was offered Russian boots. The Russian officer wrote out a pass on a piece of paper torn from the edge of a newspaper so that he could go home. So that was the end of the truck. A: The Russian army was pushing the German army back, and again the war was getting closer. 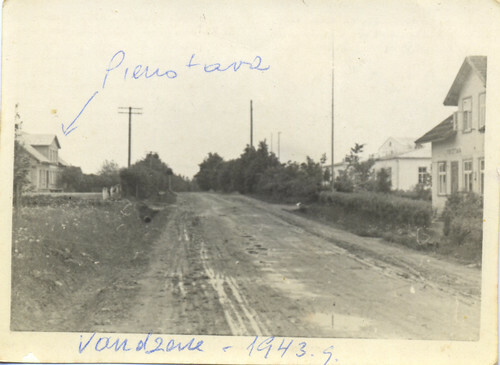 At one stage some Russian tanks came within 10 kilometres of Vandzene. Mother, Ruta and I went to a remote farm in a dense forest just in case the tanks pushed through. They were repulsed. At this time I had some skin disease on my legs; they were a mess of open sores and I had bandages on the full length of them. At this farm there were a lot of children and we all went to catch yabbies for dinner, I was not to get my legs wet. I “accidentally” slipped in and once wet spent the rest of the day in water. When the bandages were taken off the legs were really soaked, but the next morning they were well on the way to being healed. At this place I also came face-to-face with a wild boar on a forest track. The other children knew what to do, we just stood still close together and the boar went away.